Dominic - The two precursor telescopes already at Murchison demonstrate two ways that radio astronomers can detect radio waves. On the outside at least, the white dishes of ASKAP look much more like the traditional image of a radio telescope. For high frequency radio waves, dishes remain the preferred option as receivers are expensive and it makes sense to use large dishes to focus the radio waves onto a small number of detectors. But receivers for low frequency radio waves are cheap. Rather than building huge and unwieldy metal structures to focus radio waves onto a small number of detectors, it makes sense to have many more smaller antennas. This is especially true in a remote location like Murchison where keeping large moving structures in good repair is costly. The MWA takes this idea to extreme, having over 2,000 tiny antennas called dipoles. Each of which has no moving parts at all. Kirsten - After our fabulous morning at ASKAP this morning, we're now at the Murchison Widefield Array side of the site. We've had a bit of lunch and some cake, and we've now headed out along the trench lines of the MWA to the core. The configuration of the Murchison Widefield Array is quite similar to other radio telescope arrays in that you have a dense core with lots of antennas and then slowly, as you get further and further away from the core of the telescope, it gets more and more spread apart and the antennas are further apart. So, at the moment, we're in the core of the Murchison Widefield Array. It's about 500 metres away from the MWA Office. Radiating out from that office are what we call trench lines. Holes were dug in the ground to run cables along then filled in, so look very much like roads. There are seven of them radiating out. I turn around in every direction. There's just little MWA dipoles as far as you can see almost and they're clumped into groups of 16, squares of 16 that we call tiles. In one direction, I can see about 30 tiles that are all clumped together and then the rest of the MWA spreads further and further out, up to about 2 km from the centre. We've got 128 tiles total in an area that's about 3 km square. Each of these tiles, I walk up to it, it's got 5x5 metres of mesh in a big square, and then the dipoles are clipped onto there, the little antennas, and then they've all got cables running out of them that are hooked into this white box that sits off to the southern end of the tile. That white box is called a beam former. One of the special things about the Murchison Widefield Array is that it doesn't actually have any moving parts. You can't point the telescope by moving a dish and pointing it to a certain section of the sky. Instead, you point the dish electronically using a computer and that's where the beam former comes in. It forms the beam on the sky! What happens is, radio waves are coming into the telescope and each of the antennas is obviously in a different spot on the ground so the radio waves will come in to each of the antennas at a different time. Then all of the information is sent through to the beam former and the beam former is told by the astronomer who wants to use the telescope where in the sky you want to look. What it does is it adds a delay to each of the signals to combine the signals in such a way that you end up looking at the right spot of the sky. Dominic - Each of the MWA's antennas receives radio waves from all over the sky, but the telescope's control software can choose which direction to look in by introducing small delays into the signals in some of the tiles. Radio waves from the east will arrive at the eastern most tiles first before sweeping westward across the array at the speed of light. When it's completed, the SKA will produce a colossal amount of data. Since the aperture arrays will comprise of so many small antennas, each receiving their own separate signals which will have to be added together, the total amount of data flowing into the control computers will be measured in thousands of terabytes per second. This poses serious challenges for the engineers. It means that the site is littered with buried optical fibres and it's quite impossible to carry all of the data that's flowing through them back to Perth. Instead much of the computing power behind the SKA will need to be on site within a few hundred meters of the antennas themselves. The whole point of locating SKA in the desert was to get away from the radio hum that electronic devices produce. The engineers need to make sure that any radio waves the computers produce are kept away from the antennas. Kirsten - The sky has still got hints of blue, but it's mostly got grey cloud cover. We're expecting a little bit of rain tonight. Of course, all of the telescopes are waterproof, but not just that. They're also radio frequency proof because there's no point coming all the way out here and then building a big power station to power your telescope and building your receivers and your electronics that control the telescope because they will then produce radio waves. So, everything in the MRO is shielded within an inch of its life, practically, to make sure that it doesn't produce any radio waves that could interfere with the telescopes. This is particularly important for telescopes like ASKAP and the MWA because they are designed to be very, very sensitive. The MWA is designed to pick up some of the oldest signals in the universe which will be extremely weak. So, any kind of signal that's man-made and Earth based will drown those signals out. So, we have things like the CSIRO control building that has two massive airlocks to get into it. They're not to prevent air coming out, but instead to prevent radio frequency interference. And I really like how they tested the building and made sure it was radio frequency tight: They had a big signal generator inside the building and then were walking around with detectors and saying, "Okay, this weld needs a little bit more welding on it because it's letting some out." And then basically made sure the building was completely tight and nothing could get out. And the same has been done to all of the equipment over at MWA as well. So we have these lovely white boxes sitting on the trench lines. They're called receivers. There are 16 of them, 8 tiles connect up to each of these receivers and they basically look like a white box with a fridge in it and then a whole lot of electronics. And those electronics produce a lot of radio frequency interference so the white box itself shields them really, really strongly to make sure that the tiles are picking up nothing but signals from space. Dominic - The MWA and ASKAP are being used to test for new types of radio receivers that the SKA will use. 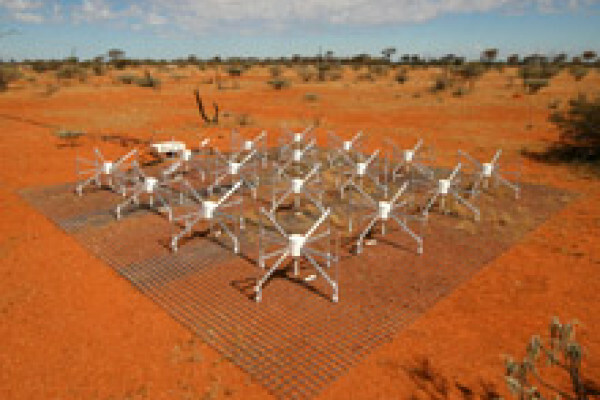 Placing them on a site which is very close to where the SKA will be built also tests whether that site is as good in practice as it looks on paper. I have to say the first results that I've seen from both the Australian and South African sites are incredibly impressive. In the absence of mobile phones and television transmitters, these are sites where the background noise becomes significantly worse whenever communication satellites were overhead. Chris - Thanks to Kirsten Gottschalk from the International Centre for Radio-astronomy Research and also to CSIRO for allowing us to record on the site and Curtin University who manage the MWA. You can hear even more about radio astronomy, the SKA and its precursors from Kirsten and Dominic on the latest Naked Astronomy Podcast. Next What keeps a Californian Prof up? How much do dogs understand when humans talk to them?